Hayden Pack finally dens; Druids get bumped from their den site. The wandering Hayden Pack finally denned. They went back to their traditional den near the Hayden Valley, which is also near the busy Canyon area in the Park. People and wolf wise, this has never been a good den site because there is a lot of traffic nearby. The pack has always produced small crops of pups, although that doesn’t mean small numbers were necessarily born. It is possible, but just speculation, that all the human disturbance is the cause of the small number of pups seen come each June. The Druids denned up towards (or maybe it was in) the Lamar River. That is well away from the highway. Unfortunately, human campers inadvertently camped too close and bumped them off their den. Doug Smith told me he has identified a new den they have dug. It isn’t known if the move caused pup mortality. In other park news, Mollies 497M was hit on the highway near LeHardy’s Rapids and died. 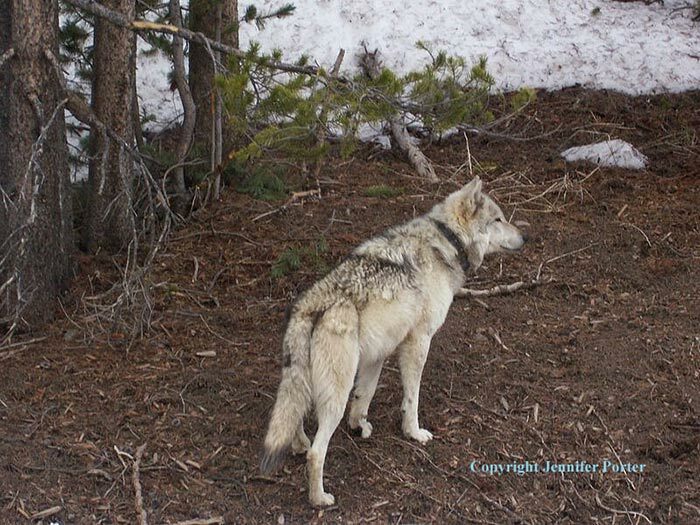 There is a new wolf pack denned at one of the old Swan Lake Pack’s den sites, but it is not the Swan Lake Pack. They left the Park, probably for good. The new pack is 4 black wolves and 2 gray wolves. It looks like every pack inside the Park denned this year. A few pups have been seen so far, but no good counts. 5 Responses to Hayden Pack finally dens; Druids get bumped from their den site. Any suggestions on locations of dens that are visible from the road would be welcome?? I plan a visit to Yellowstone in late July. It looks like only the Agates have denned in an area visible from a road. Just a note to all, please do not disclose the where abouts of any of the dens sites. Due to the YS website and people telling everyone where the dens are at it is causing the wolves, coyote’s and any other animal with a den to have to move or worse. Please use discretion!!! Thank you!! !